Sustainable Infrastructure – GPI | Greenman-Pedersen, Inc.
Infrastructure is crucial for our well-being. Its true value often only becomes obvious once it fails or is in danger of no longer connecting us or allowing us to provide basic services and functions. Infrastructure, especially in relation to transportation is in urgent need of repair/rehabilitation in many parts of the country where oftentimes century-old crucial elements of the transportation system are crumbling. The need for functioning infrastructure coupled with the recognition that low-carbon transportation modes (public transit, cycling, walking) require dedicated infrastructure, poses the opportunity for sustainable infrastructure development. GPI, since its foundation in 1966, has provided infrastructure inspection, maintenance, and construction services to a wide variety of clients throughout the U.S. We are known for providing cost-effective and state-of-the art solutions that prioritize the use of environmentally-friendly resources and ensure the protection of environmentally-sensitive areas in our projects. 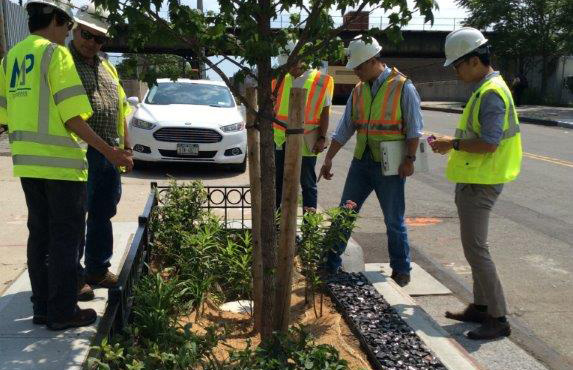 GPI is providing hydraulic screening services and the final design for approximately 1,500 right-of-way bioswales and other green infrastructure practices in New York City. These practices are distributed over approximately 1,200 acres within the tributary areas of Fresh Creek Jamaica Bay in Brooklyn and the Bronx River in the Bronx. They are reducing the quantity of stormwater that enters the city’s combined sewer system and thus reducing the risk of combined sewer overflows into these bodies of water and improving water quality. Other green infrastructure practices investigated and/or implemented include right-of-way rain gardens, greenstrips, stormwater greenstreets, infiltration basins, and the replacement of impermeable pavement with porous pavement areas. As part of the Governor’s Office of Storm Recovery (GOSR) and New York Rising Community Reconstruction (NYRCR) Programs, GPI is carrying out the conceptual design of rain gardens at the Village of Freeport municipal parking property and the pedestrian mall. By implementing these green infrastructure practices, the amount of stormwater runoff entering the existing drainage facilities will be diverted or delayed, thus reducing the risk and severity of flooding to the surrounding community. The project is also going to serve as an educational opportunity to demonstrate the benefits of green infrastructure to the local community. GPI performed the environmental design, permitting, management and compliance monitoring for the design and construction of the InterCounty Connector Bridge in Montgomery County, Maryland. This 7-mile limited access expressway passes through some of the most environmentally sensitive resources in the region. 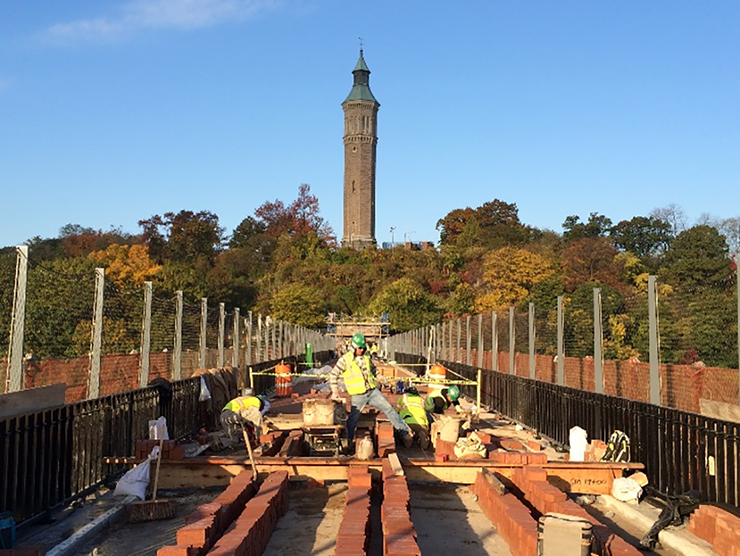 This project involved the rehabilitation of more than 1,400 ft of this historic structure, consisting of a single-span steel arch and ten masonry arch spans. Work involved rehabilitation of the stone arches and the steel arch; stabilization and conservation of the aqueduct pipes; de-leading and painting of the bridge; restoration and lighting of the brick walkway; installation of lighting underneath the arch spans; installation of benches and barrier-free access ramps; and installation of a visitor information system. The bridge, which was originally the main water supply conduit for New York City and is the oldest active bridge structure in the city (circa 1848) – allows pedestrians and bicyclists to travel across the bridge and enjoy the scenic view of the Harlem River from the Bronx and Manhattan. This project was recognized for its outstanding achievement in bridge engineering demonstrating artistic merit and innovation in the restoration and rehabilitation of bridges of historic or engineering significance.